Last November a small, brown, padded envelope with a tracking number showed up in my mailbox. It was from my dad. He hadn’t mentioned he would be sending me anything. The package contained a single, stubby pencil, which he had attached to a piece of cardboard with two pieces of transparent tape. I’m looking at the pencil now, as I write this: The pencil is dark blue, with at least a third of its paint chipped off. The exposed wood is dark too, with age, or use, or both. The ferrule is missing, and the cylinder of bared wood normally hiding under the ferrule has been worn into a cone shape. And there’s a piece of masking tape wrapped around and covering the part of the pencil where the brand name and hardness are usually printed. The tape has faded and hardened with age. The point of the pencil is short, the lead tip mostly worn down. One of the joys of collecting is discovering new categories of things to appreciate and to accumulate. So, voila! Another thing to collect: Toolbox Pencils! Collecting toolbox pencils may not be a very practical way to add to your pencil trove, but it will connect you with subtle nostalgic forces. 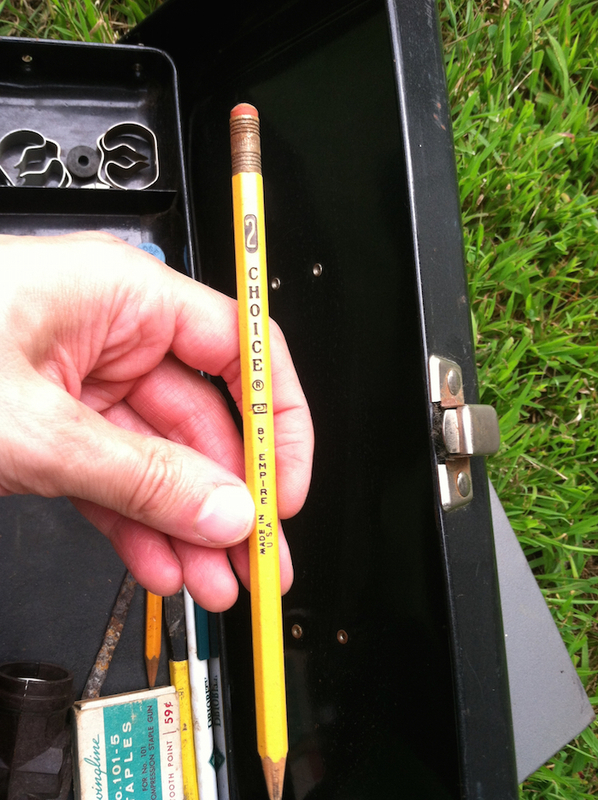 Toolbox pencils are generally in poor to awful condition. That’s just the way it is. They’re used to pry open paint cans. They roll around with sharp, heavy metal objects, sometimes for decades. They are used to spread glue. They fall off roofs. They’re subjected to endless abuse. And a toolbox pencil is more expensive to acquire than the exact same pencil by itself, because toolbox pencils are priced along with all of the other odds and ends the seller has left in the toolbox–presumably to entice you into buying it (even though you have six toolboxes already). But, these days almost everyone thinks there’s a collector market for everything, and if you call attention to some beat up old pencils, the seller wonders if you know something they don’t, and the harder you try to convince them you “just like pencils,” and won’t be listing them on eBay, the less they’ll believe you. Even if a seller is unusually trusting and does believe you, they’re still trying to clean out their garage, so usually they’ll call your bluff. And this is how you end up with another two-, or five-, or maybe ten-dollar box of junk. Sometimes there happens to be a tool you want in the box anyway. But, collecting toolbox pencils will get you wondering about things. Consider this nifty little grey toolbox I got for $2 at a tag sale in Durham, NH. a retractable ballpoint pen—PRIORITY TITLE SERVICES, with a phone number and a website address printed on the barrel. I can’t help but picture a calloused, paint-splotched hand picking up that little screwdriver. A tool like that comes in handy when, right in the middle of a painting project, you discover someone has forgotten to remove an outlet cover, or a light-switch plate. It’s good to see wooden handles and “Made in the USA” printed on things. It reminds me of bygone days when things were built to last, not manufactured to obsolesce, like plastic handles. The pencils still write just fine. 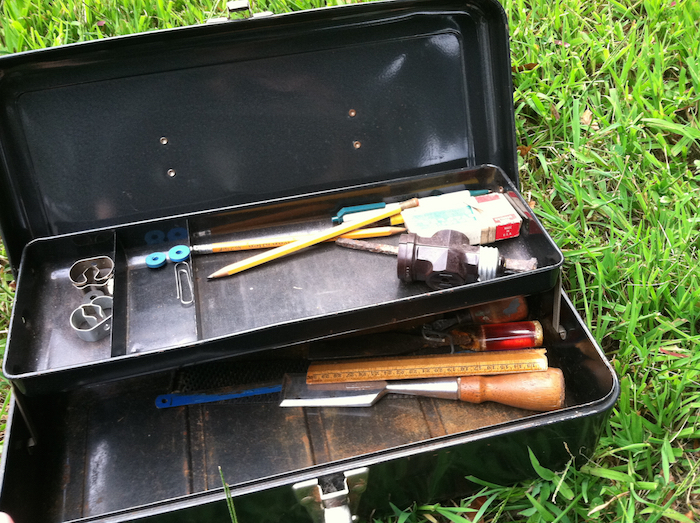 This toolbox must have still been in use when the wave of disposability started setting in. You can’t help think about the owner of these objects, about the projects they were used for, about the times they lived in. Old things excite the historical imagination. I’m afraid to take these pencils out of their natural habitat, because then they’ll lose their associations with the past, even if it’s a past I’ve mostly imagined. 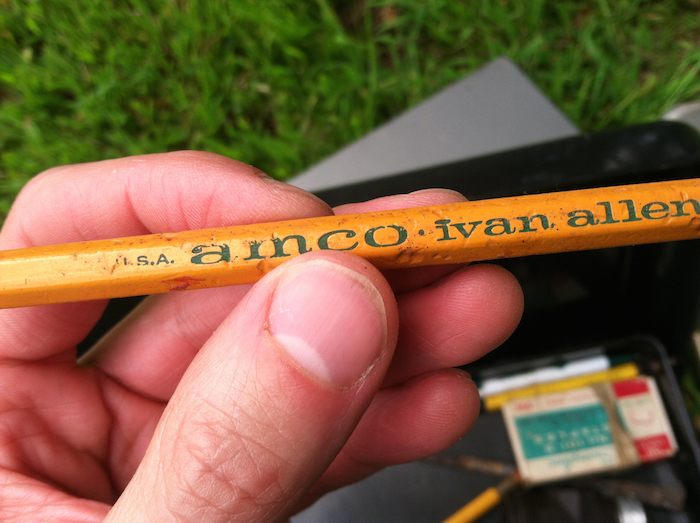 This pencil has been with me in my toolbox as long as you have been alive. I’m listing some of the many projects for which it was used: building the deck, helping your grandfather remodel his rental house, remodeling the garage into a family room, remodeling the house on Hammond St, making the go cart and airplane. This little blue pencil worked on houses I’ve lived in and played a small part in many of my cherished memories. Right now the pencil is still taped to the piece of cardboard, but part of me is tempted to throw it into my own toolbox. Let it roll around in there, like it’s used to. Put it back to work! Someday maybe I’ll pass it on, and maybe someone will wonder what it’s been through, where it came from. Thank you for posting again! It is good to have Heirloom Pencils back. Please include a photo of your father’s pencil. I wish my dad would send me his.